The Title Banner is at the top of every page within Encyclopedia of Yarra Glen and District. About provides information about the Yarra Glen and District Historical Society and Encyclopedia of Yarra Glen and District project. Membership provides information about joining the Yarra Glen and District Historical Society. 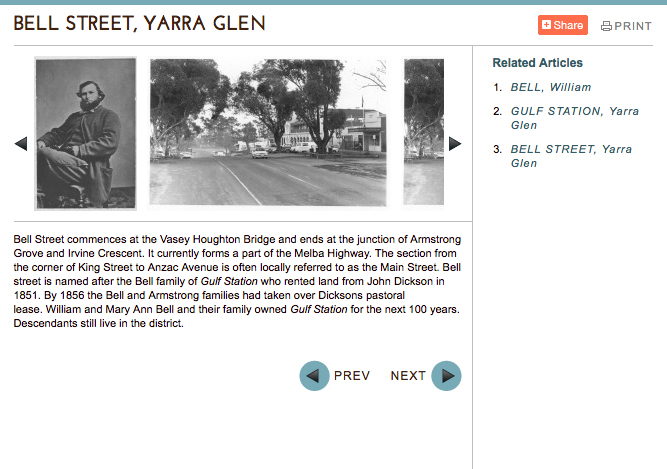 Newsletters provides access to all past newsletters generated by the Yarra Glen and District Historical Society. Quick Search allows you to quickly find a word contained within Encyclopedia of Yarra Glen and District. by place (Places), alphabetically (A - Z), Year (Year) or by viewing images (Gallery). Places: Every Place entry within Encyclopedia of Yarra Glen and District has been grouped into one of 3 key areas such as Properties, Streets and Roads and Districts and Parishes. A - Z: Browse alphabetical lists of the Entries, Resources and Archives. The list of Entries grouped within the "A-Z" can be navigated by clicking the letters. Year: Every Year entry within Encyclopedia of Yarra Glen and District has been grouped into 3 key contexts; Yarra Glen and District, Australia and The World. Use the arrows at left and right to navigate between time periods. Use the "Jump to" drop down menu to view a specific year. Gallery: Images within Encyclopedia of Yarra Glen and District have been grouped into one of 4 key areas such as Places, A-Z, Map and Browse All. Each images is either Free to download or Charged depending on its copyright circumstances. Each Entry can consist of text and images. Clicking a thumbnail image will open a larger version in a separate window. Clicking this image will take you to the Gallery. To the right of the body text a list of Related Articles will navigate you to articles relating to the entry. For optimum display and performance, a computer monitor with a minimum resolution of 1024x750 pixels is recommended.